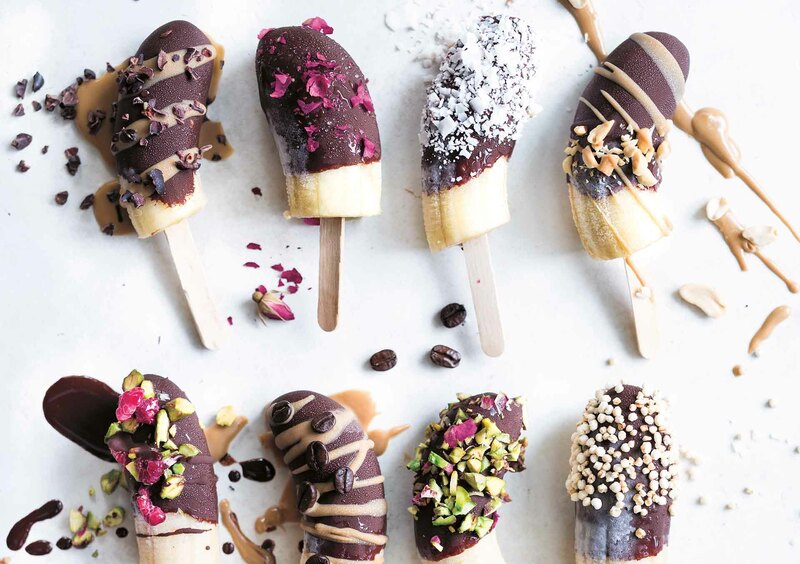 Get creative with toppings for these sweet little banana popsicles. You can also try this recipe using strawberries or watermelon. 1. Line a baking tray with baking paper. Insert the ice-cream sticks into the banana halves. 2. Place the chocolate sauce in a cup or mug and the toppings in little bowls. 3. Dunk each banana in the chocolate sauce, then sprinkle with one or two different toppings, changing the combination of flavours each time. Place on the prepared tray and freeze for 30–60 minutes, or until the chocolate has set. Leave for 2–3 hours if you would like frozen bananas. 4. Enjoy straight from the freezer! They’ll last well in an airtight container for up to 2 weeks. Tip: Try this recipe using strawberries or watermelon chunks instead of bananas. Recipe from Elsa's Wholesome Life: Eat Less From a Box and More From the Earth by Ellie Bullen, published by Plum, RRP $34.99. Dietitian Ellie Bullen shares delicous, plant-based recipes on her website, elsaswholesomelife.com. Her first cookbook, Elsa's Wholesome Life is out now from Plum.